Washington (CNN)The top US nuclear commander said Saturday he would push back against an order from President Donald Trump for a nuclear strike if it were "illegal." Speaking at the Halifax International Security Forum in Nova Scotia, Canada, Gen. John Hyten, who is the commander of US Strategic Command, shared what would happen if he were ordered to launch a nuclear strike. "I provide advice to the President," Hyten said. "He'll tell me what to do, and if it's illegal, guess what's going to happen? I'm gonna say, 'Mr. President, that's illegal.' Guess what he's going to do? He's going to say, 'What would be legal?' And we'll come up with options of a mix of capabilities to respond to whatever the situation is, and that's the way it works. It's not that complicated." US Strategic Command oversees US nuclear weapons and missile defense. Hyten's remarks come after a Senate Foreign Relations Committee hearing this week on the President's authority to launch nuclear weapons -- the first such congressional hearing in more than 40 years. While the President retains that authority, Hyten publicly emphasized that the US military always has the obligation to follow only legal orders, including those entailing the launch of nuclear weapons. At the Senate hearing this week, experts testified that the use of nuclear weapons must be proportional to a threat, and the Pentagon has extensive options for use of conventional weapons against North Korea. 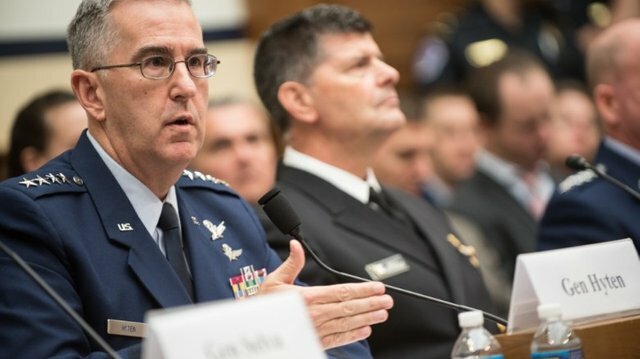 Retired Air Force Gen. Robert Kehler, who previously served as the commander of US Strategic Command under President Barack Obama, explained at the hearing that there are layers of safeguards within the current system designed to ensure any order is both legal and proportionally appropriate. "US nuclear forces operate under strict civilian control. Only the President of the United States can order the employment of US nuclear weapons," Kehler said. "This is a system controlled by human beings ... nothing happens automatically," he said, adding that the US military does not blindly follow orders and a presidential order to employ nuclear weapons must be legal. While the President retains constitutional authority to order some military action, Kehler explained that the nuclear decision process "includes assessment, review and consultation between the President and key civilian and military leaders, followed by transmission and implementation of any Presidential decision by the forces themselves." "If there is an illegal order presented to the military, the military is obligated to refuse to follow it," he said. Members of the Senate Foreign Affairs Committee called into question a decades-old presidential authority to deploy nuclear weapons. "We are concerned that the President of the United States is so unstable, is so volatile, has a decision-making process that is so quixotic that he might order a nuclear weapons strike that is wildly out of step with US national security interests," said US Sen. Chris Murphy, D-Connecticut. Republican members of the committee were less blunt in their criticism of Trump's judgment but did seek assurances that there are legal and strategic oversight measures in place to prevent the rash use of nuclear weapons. Ultimately, some of those who testified warned against legislative changes to rein in the President's authority to exercise nuclear authority. Brian McKeon, who served as principal deputy undersecretary of defense for policy in the Obama administration, told the committee: "I think hard cases make bad law, and I think if we were to change the decision-making process in some way because of a distrust of this President, I think that would be an unfortunate precedent."